once again, the magic of glue. we put out saucers of glue and invite preschoolers to dip sticks in and spread glue as needed. then begins the creation of craft stick sculptures. we talk about dimensions as we build these basically flat creations. i still see a small one hanging in a preschool mama’s car years later. this is one i actually did at home with my then 7 year old naomi and 3 year old micah in honor of eliza’s birth. as always, if pieces are not solid once the glue has dried, the teacher can add more glue. 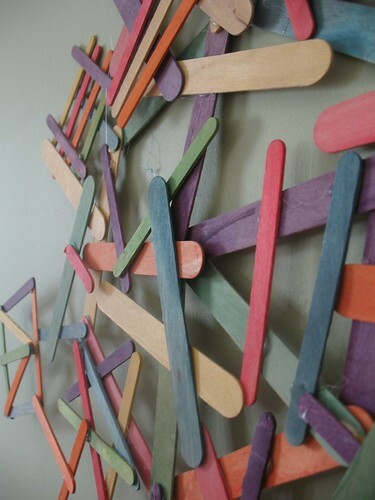 these pieces look great flat against a wall or suspended horizontally by fishing line. we did that over a changing table area for eliza…it was like she was looking at the underside of a big web.